As I've mentioned many times before, I've spent the past 4 summers digging with the Apolline Project at Aeclanum, a site in the Campania region of Italy. While Monday to Friday, we're on site excavating, the weekends are free for us to relax and explore the local archaeology and heritage sites. For the past couple of years, one of my friends has taken her car, giving us a bit more freedom to explore areas a bit further afield. This year, we decided to book an air b'n'b, and set off to the region of Puglia, a three hour drive from our base in Passo di Mirabella. Puglia is a beautiful region of Italy, which forms the 'heel' of Italy's boot. It's one of Italy's most famous regions, not least for its Mediterranean coastal towns, it's capital of Bari or it's historic trulli. 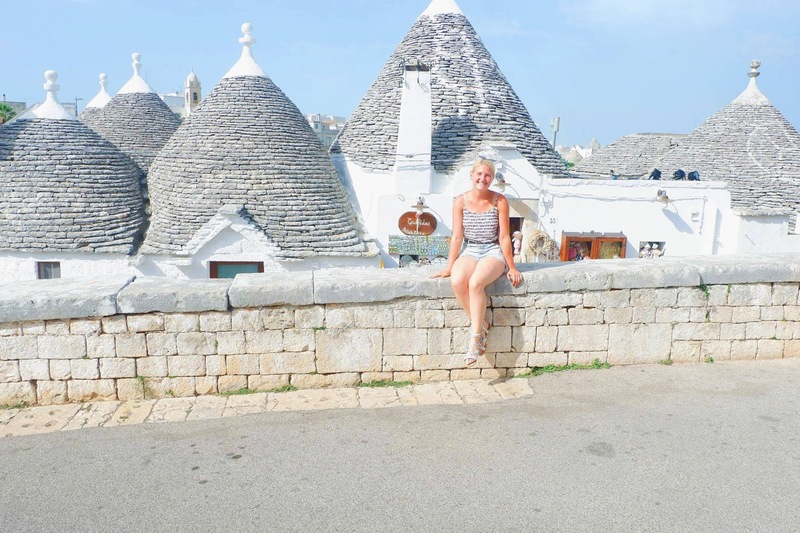 Our first stop on the trip was to the UNESCO World Heritage site of Alberobello, a stunning hilltop town, filled with white washed buildings, called Trulli. Trulli (singular: Trullo) are small buildings, constructed from the local limestone and without mortar, making them dry and easy to demolish. The roof is constructed of stone, and conical in shape in order to support itself. 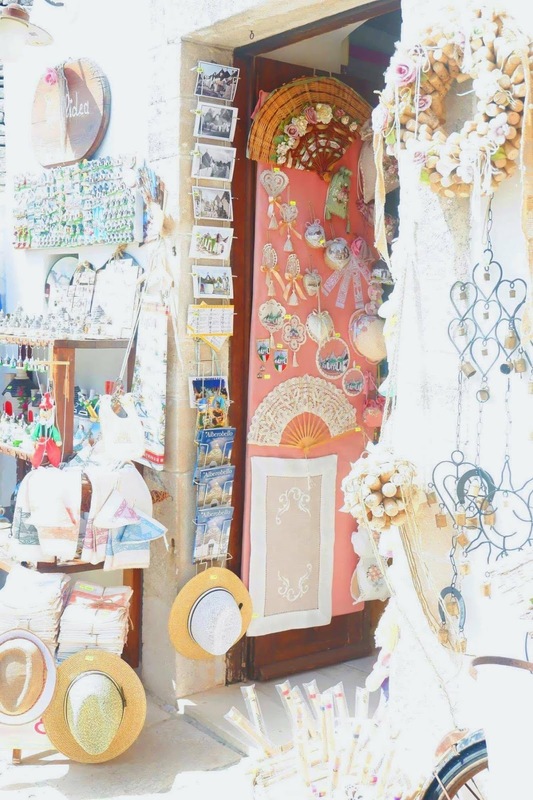 Around the Puglia region, you can see Trulli dotted around farms, used as sheds, but none compare to the small town which was originally composed only of Trulli. 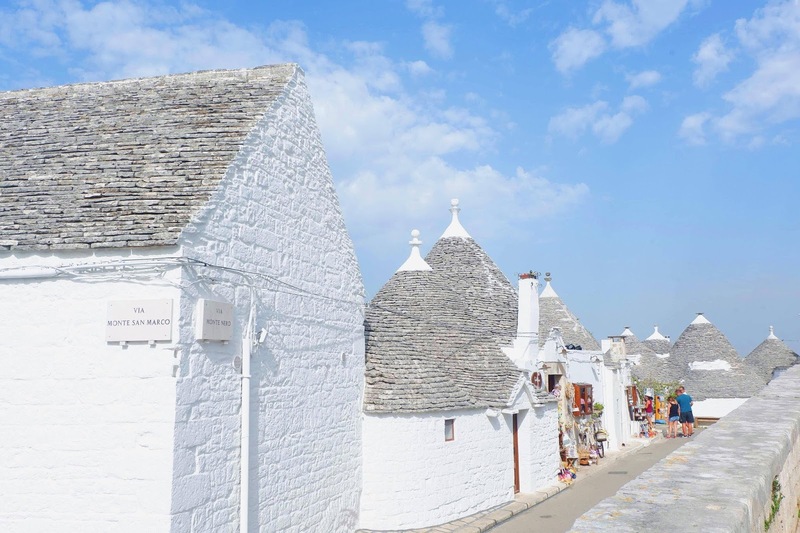 The first Trullo was constructed in 1635, as a small tavern, and more Trulli were constructed around, forming the small town. In order to avoid paying taxes to the Spanish Viceroy of the Kingdom of Naples, Alberobello couldn't be classed as an inhabited settlement and, therefore, the peasants working on the farm land in the area had to live within these small Trulli, which were easily demolished. Alberobello was finally given town status in 1797. 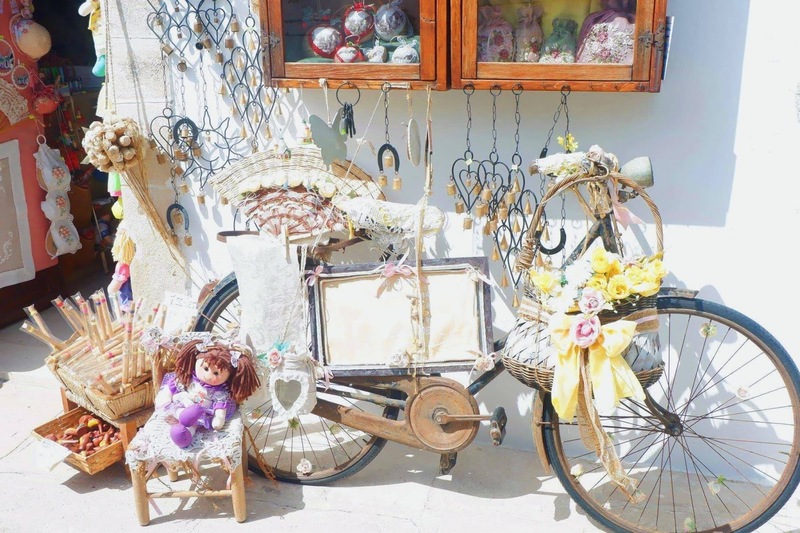 Now, the Trulli are used as small gift shops, selling cute trinkets and souvenirs, or bars that sell local wine. We did stumble upon a couple of Trulli that were being rented as holiday accommodation. Walking through the streets lined with the white washed buildings is mesmerising. Each building has something unique about it, with little placards or wooden signs, pops of red and pink flowers hanging in baskets, and blue doors framed by the white walls. After walking around the streets, we stopped in by a bar to get a drink - one thing to be aware of is how suddenly hot it feels. The sun radiates off of the white buildings, and walking up the slight incline to the heart of the Trulli buildings does tire you out. The bar we rested at had a courtyard area with beautiful views of a sea of stone rooftops. With our drinks, we were given a typical Italian welcome and tray of snacks, including local olives in a mason jar, which I could not stop eating. The roofs of the Trulli are stunning, the stone work creates a beautiful cone, and some roofs have symbols painted on them. 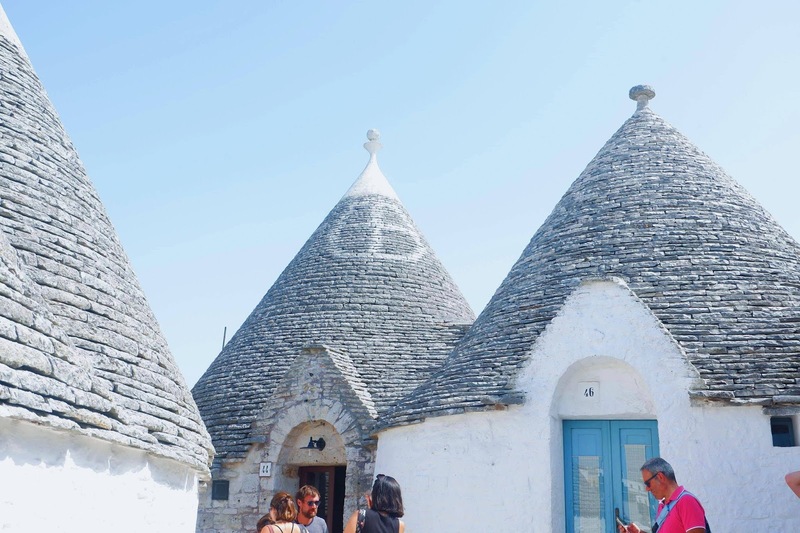 On the top of the cone, many of the Trulli have sandstone pinnacles which have a huge array of forms, and are believed to be the symbol of the craftsman who made them. The white symbols painted onto the stones also come in a huge variety of patterns, shapes and forms. Its unknown exactly why these symbols were painted, but they're believed to represent different religious and mystic beliefs, and are thought to have offered protection to the inhabitants. Some of the patterns suggest an astrological significance, such as planetary symbols, the sun and stars, while others depict hearts, the evil eye and crosses. You can still see many of the symbols on the roof - many of which have been repainted. 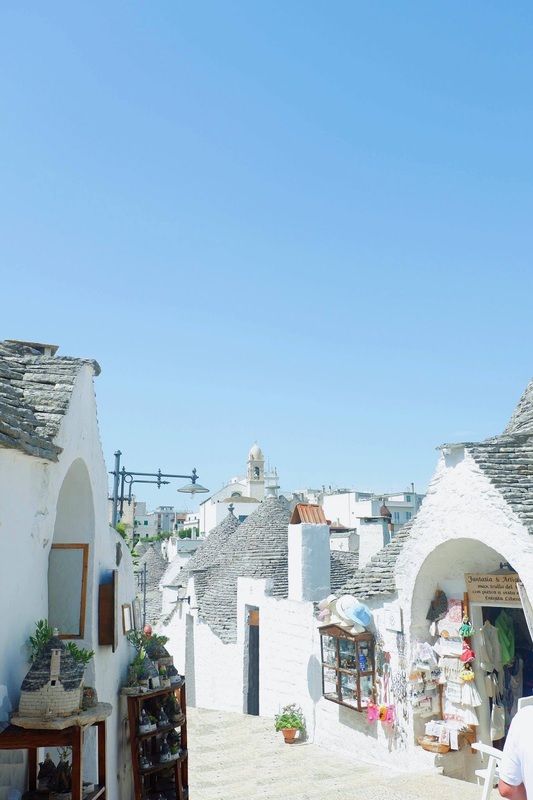 The town of Alberobello was truly beautiful to visit, despite the bus loads of tourists that you see parking at the nearby car parks, there is a certain peace to the town, and its easy to find yourself lost up a side street without any other tourists around. 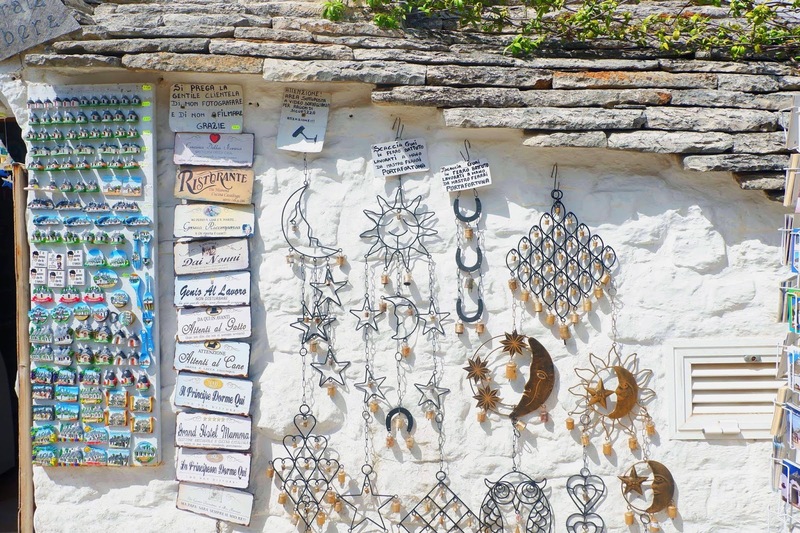 It's definitely a place to get some unique souvenirs, like small ornaments in the shape of Trulli. Before I had visited Alberobello, I'd never even heard of this small town. Now, I can't stop sharing about its beauty, and I'd recommend it to anyone in the Puglia region. I had never heard of this place - it looks magical! Italy is one of my favourite countries to travel in so adding this to the bucket list!